Beautiful hand painted giraffe by Liz. 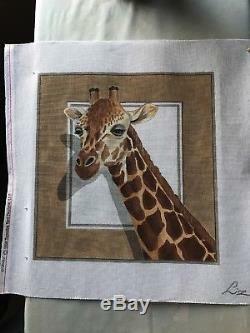 The item "Peering Giraffe Hand Painted Needlepoint Canvas Liz Dillon AP 301" is in sale since Sunday, July 23, 2017. This item is in the category "Crafts\Needlecrafts & Yarn\Embroidery & Cross Stitch\Hand Embroidery Cloth & Canvas\Plastic Canvas". The seller is "dll5602" and is located in Goodyear, Arizona. This item can be shipped to United States.